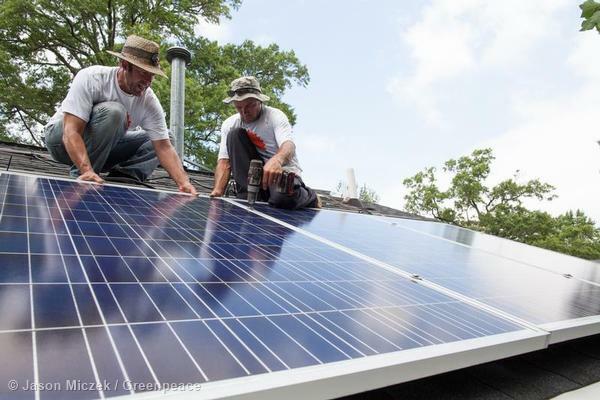 Some good news today for renewable energy and global warming! A new study shows that the cost of utility-scale solar energy is as low at 5.6 cents per kilowatt hour in comparison to natural gas at 6.1 cents and coal at 6.6 cents. The investment banking firm Lazard, who conducted the study, highlights that even without subsidies solar is coming in at 7.2 cents and wind at 3.7 cents. You can read the New York Times story about the report here. Solarize Charlotte Project. by Jack Miczek, Greenpeace. For North Carolina we’ve already seen our national ranking as #4 in solar growth and wind energy opportunities abound, especially off-shore. As renewables become more competitive and create new economy jobs, will our state continue to advance renewable energy and do our part to combat global warming? Will we put ratepayers first? Or will we continue down a fossil fuel path of fracking and off-shore oil drilling? Actually the REAL good news about global warming is that it does not exist. Plus you are going off the accepted spin of “climate change”….bad liberal!